The past year and a half have really messed with my head. The social and political climate that we reside in has me on edge, and accordingly, I've weaned myself off of Facebook and banned myself from reading Twitter after 7 p.m. Instagram alone has become a pseudo happy place teeming with upbeat, artsy, pretty pictures. 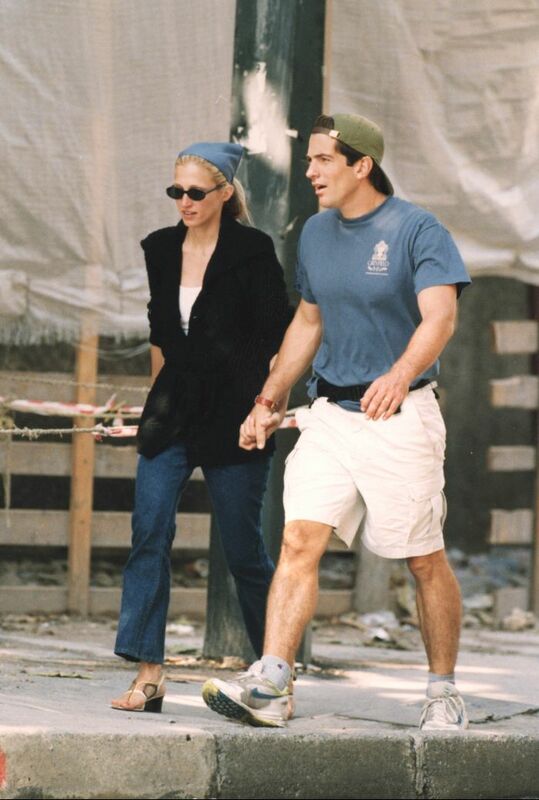 Lately, my feed has been full of photos of style icon Carolyn Bessette-Kennedy. Sadly, Kennedy passed away in a plane crash alongside her husband, John F. Kennedy Jr., in 1999, but throughout the '90s, the Calvin Klein publicist was a New York fashion icon and what now we might consider an OG street style star. What is it about her ensembles that speaks to those of us who were too young to remember the buzz the first time around? For me, it's not just the simple fact that trends are cyclical and what she wore 20 years ago is back in fashion. It's the fact that her style is both fearless and understated, that she can wear Nike sneakers and a Narciso Rodriguez dress with equal ease. Today more than ever, we're looking for clothes that don't just look good, but offer us comfort—Carolyn's style perfectly toed that line. While she may have missed the reverberations of the current political climate, her style reflects the trends we've seen designers return to: an understated high-low way of dressing that proves comfort, power, and confidence can exist harmoniously. Below, I'm outlining six examples of her cool style and shopping out pieces that can help us channel the '90s icon. I'm a jeans-and-tee kind of gal, which is why an oversize blazer has become my secret weapon. One look at Carolyn's ensemble and it's easy to see exactly why this piece is so classic. It can transform any ensemble from casual to polished. I'm pretty sure Carrie Bradshaw wore this exact outfit at some point too, but while Carrie's fashion verged on decidedly eclectic, on Caroline a flouncy floral dress and pair of pointed pumps feel both polished and relaxed—two things that, at face value, may seem mutually exclusive. It's been a year or two since I decided to finally eschew my skinny jeans for kick flares, and I've never looked back. But, come warm weather, the one thing needed is a great strappy block heel to add a bit of pizazz. While these Céline sandals are a true 2018 take on Caroline's minimal choice (sadly, they're not sold online), I think the Tibi heels below make for a great alternative. There are a lot of things about this outfit that speak to me: a subtle flared jean, that oversized headband… but most of all, it's the sunglasses that just belong on my face. Though smaller sunglasses in general are having a moment, the '90s-era oval shape is a universally flattering shape. Tall boots and a long skirt are two things I would have balked at putting together just a year or two ago, but there's something about the understated combination that attracts me these days. The pulled and tucked button-down gives me instant Jacquemus vibes. While her ensemble isn't a traditional black tie look, the way she reworks classic pieces feels especially inspired. Available in sizes FR 34 to 40. Now, you're ready to channel Carolyn's look too.